How to clear the increasing several GBs of app caches on iPhone accumulated by Facebook, Twitter, WhatsApp etc? Everytime we use an App, it stores cache data. Not only huge space has been occupied, but also the running speed is affected. iMyFone Umate iPhone cleaner provides you free trial to 1-click clear all cache in iPhone (iOS 12 Supported). 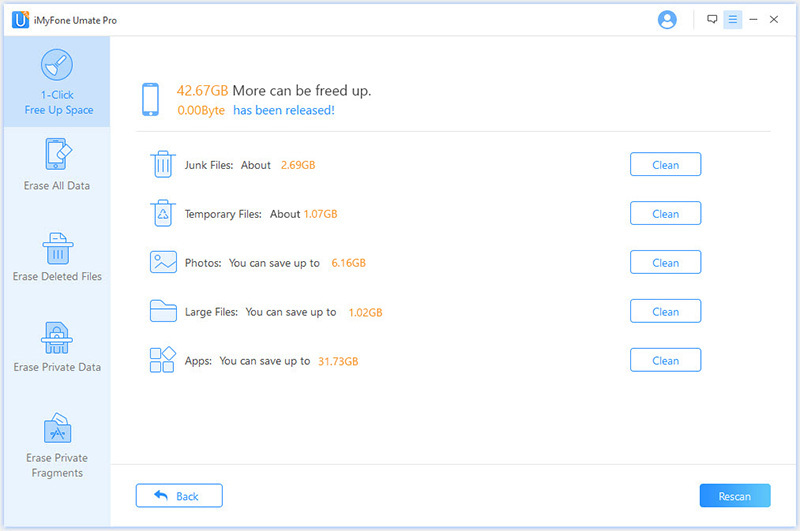 With it, you can clear junk & temporary files on iPhone for free, and Apps caches are included. Step 1. Download the iPhone cache cleaner to get going with the process. Step 2. Run the program and connect your iPhone via USB cable. Then you'll see the big button "Quick Scan", just click it. Step 3. Once the scan finished, you will know how space can be freed on your iPhone. Just click on "Clean" button beside "Junk Files" to totally clear all cache on iPhone. However, the above free ways to clear app cache in iPhone is not permanent, which means cleared cache can be recovered by the right tool. If you need to permanently clear app cache on iPhone with zero chance of recovery, you can use iMyFone Umate Pro Win/Mac iPhone data eraser. Apart from permanent deletion of cache, it gives you more powful features to reclaim iPhone space. 1-click to clean 30+ types of junk and temporary files: crash logs, photos cache, app cache, corrupted files, etc. Permanently clear incomplete traces and cache of 3rd-party apps to protect privacy. Permanently erase current & previously deleted data, 100% unrecoverable - Safari history/cache/cookies, WhatsApp, message, contact, note, call logs, WeChat, etc. 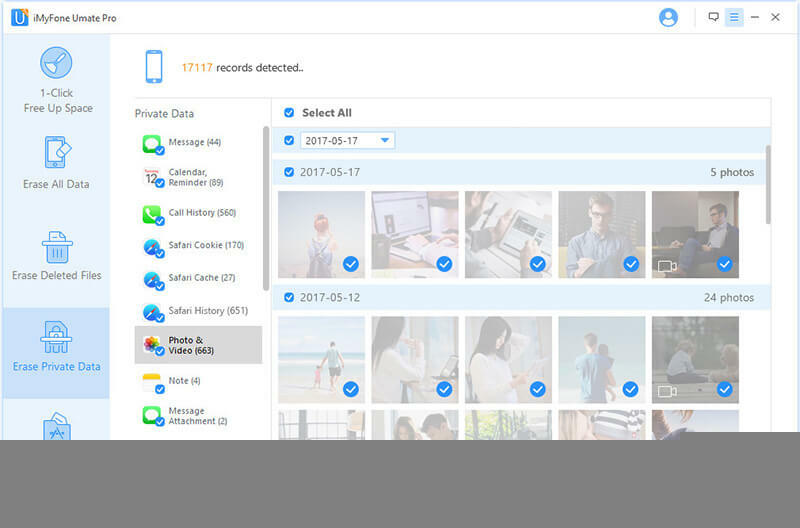 Losslessly compress photos to reclaim 75% of photo space with photo backup. Auto detect and mass delete large files to free up massive space. Selectively uninstall multiple apps by one click to release space. How to Permanently Clear App Cache on iPhone? Step 1. Download and install iMyFone iPhone Eraser on computer and connect your iPhone to it. Step 2. Choose "Erase Private Data" tab from the left sidebar and let it begin "Scan". Step 3. When scan finishes, you can preview and select Safari cache/cookies/history or any data. Then hit "Erase Now" button and confirm the erasure. It is suggested to download iMyFone iPhone Eraser and run it for free to check how many previously deleted files are left to be recovered on your iPhone. Why Is It Important to Clear Cache on iPhone? Clearing app cache on your iPhone even in iOS 12 is very important if you want to enjoy full performance on your iPhone. An unclean device will lead to iPhone sluggishness. While there are some ways that can be adopted to clear iPhone app cache, but some options come with various cons. For example, clearing iPhone app cache from settings offers no privacy guarantees because the cleared history and data can be recovered. It is also time consuming and also costly. This is a disadvantage especially if the device is to be sold to another user. 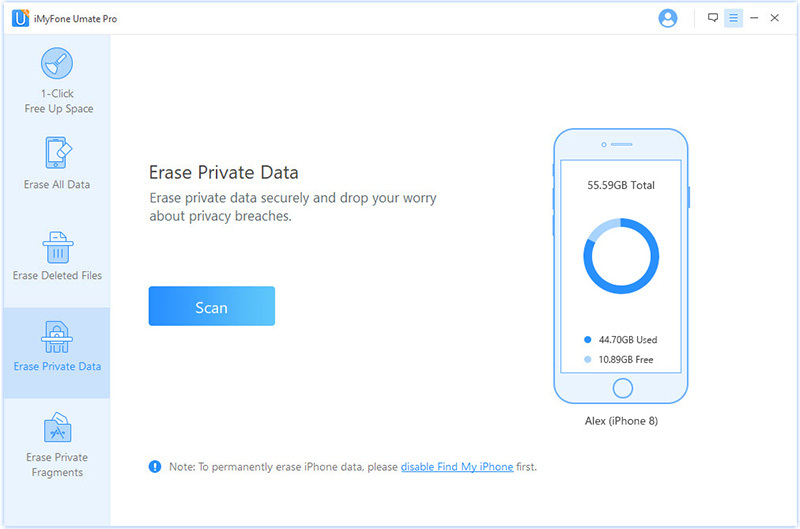 However, iMyFone Umate Pro is easy to use and remains the best way to clear your app caches as data cleared remains 100% unrecoverable which makes a lot of sense especially for those selling their iPhones and wants to keep their erased data from being recovered by the new user. I like free ways, but the truth is that free ways won’t works well. I found my Whatsapp itself is only XXMB, but the total storage the app takes up is almost 6GB!!! Meaning i have more than 5GB caches?!!! confused by app caches for long time! i like this article ! I know the caches exist, but just do not want to uninstall-reinstall the apps again and again.